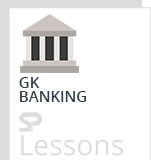 Banking Awareness Quiz 4 – Practice Sets article provides the list of several bank related questions to prepare aspirants of different competitive exams in India, primarily for banking related employment. The article Banking Awareness Quiz 4 – Practice Sets is very useful for different exams such as IBPS PO, Clerk, SSC CGL, SBI PO, NIACL Assistant, NICL AO, IBPS RRB, Railways, Civil Services etc. Q1. By which ‘Micro Finance Development and Equity’ fund is maintained in India? Q2. Which of the following is known as the Weak Currency? Q3. Which of the following refers to a single small bank which provides financial services to the local community? Q4. DTL stands for which of the following? Q5. Wholesale banking is also called as which of the following? Q6. ‘We Understand Your World’ is the tagline of which of the? Q7. In which year HDFC Bank was established? Q8. IDF stands for which of the following? Q9. In which year Andhra Bank was established? Q10. IDF can be set up by which of the following? Q1. MSF stands for which of the following? Q2. PCA stands for which of the following? Q3. Who is the CEO of Dena Bank? Q4. AFA stands for which of the following? Q5. BHIM stands for which of the following? Q6. In which city the head office of IndusInd Bank is situated? Q7. Who is the CEO of HDFC Bank? Q8. ‘Relationship beyond banking’ is the tagline of which bank? Q9. Which organization maintain Cash Reserve Ratio? Q10. What is the recent Import Duty onSugar decided by the Govt. to restrict cheap inward shipments and maintain domesticprices? Q1. Which of the following statements is/are the feature(s) of Aaykar Setu initiative launched by Ministry of Finance? Q2. The reform initiative DBT schemestands for which of the following? Q3. Which of the following accounts does not provide interest? Q5. Which of the following is not a financial institution? Q6. Invisible Export is related to which of the following? Q7. Which of the following refers to the flow of funds from one country to another to earn a short-term profit? Q8. What is a Bank Draft? Q9. In which city the head office of National Housing Bank is situated? Q10. Who is the CEO of Punjab And Sind Bank? Q1. In which city the head office ofAllahabad Bank is situated? Q2. Who is CEO of Dhanalaxmi Bank? Q3. ‘Experience Our Expertise’ is the tagline of which bank? Q4. In which city the head office of HDFC Bank is situated? Q5. In which city the head Quarter of RBI is situated? Q6. NHB is the Apex Bank for which of the following? Q7. Which of the following Banks has announced collaboration with IIC to boost trade? Q8. IMPS stands for which of the following? Q9. IBC stands for which of the following? Q10. Which of the following statements is true about NHB? Q1. The non profit organization GSTN isformed to create which platform? Q2. Who is the CEO of Bandhan Bank? Q3. What is threshold limit of GST forNorth Eastern states? Q4. Section 13 of Negotiable Instruments Act 1881 deals with which of the following? Q5. Which of the following banks has largestnumber of offices in India after SBI? Q6. Who is appointed as the MD and CEO of National Stock Exchange of India? Q7. Who is appointed as the MD and CEO of National Stock Exchange of India? Q8. Which of the following organizations has filed an Initial Public Offering? A. Bajaj Allianz General Insurance Co. Ltd.
B. Bharti Axa General Insurance Co. Ltd.
C. Cholamandalam MS General Insurance Co. Ltd.
Q9. What is percentage of rise in transaction through cards post demonetization ? Q10. Which Bank has received $150 mn from OPIC to fund SME lending? Q1. Who has been Conferred the”Personality Of The Year” Award by Skoch Consultancy Services? Q2. “Your Family Bank, Across India” is the tagline of which of the following Banks? Q3. What is/are the function(s) of EXIMBank? Q4. Who generally pays for the loss in case of an insurance arrangement? Q5. FSDC stands for which of the following? Q6. Who are benefited by the Reverse Mortgage Scheme? Q7. What is Fiat Money? Q8. What is the motto of Marginal Standing Facility introduced by RBI? Q9. In which year SBI has merged with the Bharatiya Mahila Bank? Q10.What do you mean by Cryptocurrency? Q1. IBBI stands for which of the following? Q2. Which bank has launched the one-stop integrated website for the home buyers? Q3. Which of the following banks has launched the National Digital-Only Marketing campaign? Q4. Indian Chamber of Commerce will host a Global Business Forum in association with which state? Q5. With which bank Meghalaya Govt. has signed MoUs to migrate Govt. Transactions in digital mode? Q6. In which city the Sahara India Life Insurance is based? Q7. Who is the CEO and MD of IDFC Bank? Q8. In which country the head quarter of Bank for International Settlements is situated? Q9. “Relationships beyond Banking” is the tagline of which bank? Q10. IIN stands for which of the following? Q1. In which year Deposit Insurance and Credit Guarantee Corporation (DICGC) was set up? Q1. Who has introduced the bill to facilitate SBI merger Bill with its subsidiary banks ? Q2. Which of the following banks has launched Met Loan and Life Surakhsha (MLLS) in association with PNB Metlife ? Q3. Carlyle Group has acquired entire 26% stake of GE Capital Groups in a joint collaboration with which bank ? Q4. How many Currency Verification systems RBI will hire for 6 months to separate fake notes from the scrapped notes of Rs. 500 and Rs. 1000 denomination ? Q5. “Your Tech- Friendly Bank” is the tagline of which Bank ? Q6. In which year the Indian Overseas Bank was established ? Q7. What is the function of Acid-test ratio ? A. It counts the amount of loan. B. It measures business liquidity. C. It regulates the interest rates of Bank. Q8. Which of the following assets can easily be converted into cash ? Q9. What is the function of CPI ? A. It regulates the interest rates of Bank. B. It counts the amount of loan. Q10. What is the Floating Rate ? Q1. Which bank has launched a “Multi- currency Forex Card” to offer smooth experience for the Overseas travelers ? Q2. According to the latest World Economic Outlook Report of IMF what will be the growth rate of India in 2018 ? Q3. What is/are true about the Banking Regulation(Amendment) Bill, 2017 ? A. This Bill authorities RBI to direct Banking companies to resolve the stressed assets problem. B. It was introduced by Arun Jaitley in Lok Sabha. C. It will replace Banking Regulation(Amendment) Ordinance, 2017. D. It allows RBI to initiate resolution process of insolvency. Q4. Which of the following has started the Merchant Banking Operation ? Q5. Which country has recently has achieved total independence from International Monetary Fund and World Bank ? Q6. “A Tradition of Trust” is the tagline of Which bank ? Q7. Which of the following banks is going to buy Digital Payment Platform “Freecharge” ? Q8. Bajaj Allianz Life Insurance has renewed its corporate agency agreement with which bank ? Q9. Who is the CEO of Axis Bank ? Q10. What is the minimum period for accepting Deposits under the Foreign Currency Non- Resident (FCNR) scheme ?